Newly discovered sites shed new light on what was thought to be a sparsely populated area of the world’s largest river system. 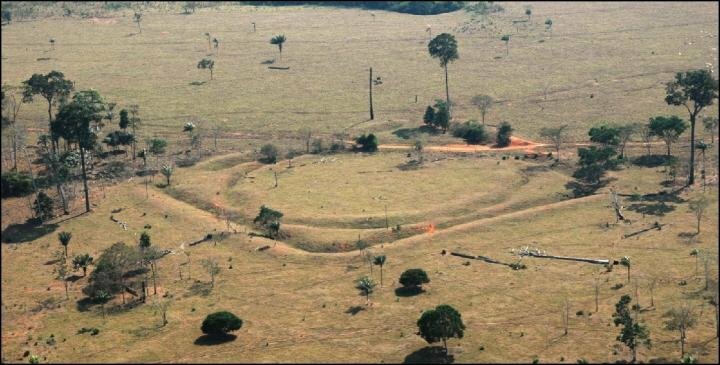 Up to a million people may have lived in a part of the southern Amazon basin in the centuries before European colonization, building a network of villages surrounded by elaborate earthworks, archaeologists have found. Guided by satellite imagery, British and Brazilian scientists have found 81 previously undiscovered sites along the southern rim of the Amazon and estimate that hundreds more are out there. The findings, published in the research journal Nature Communications, shed new light on the history of human settlement in what was long believed to be a sparsely populated sector of the world’s largest river system. The sites were typically found on relatively flat ground and surrounded by round, square, or hexagonal moats, mounds, and berms. Some of the earthworks spanned nearly 400 meters (1,300 feet). Others appear to have been used only for ceremonial occasions, Jonas Gregorio de Souza, an archaeologist at the University of Exeter and the lead author of the study, told Seeker. “We know from historical accounts of the region from the 18th century that it was full of very large villages connected by roads, so there was this clue from the historical record that we would find similar kinds of settlements there,” de Souza said. The study, which was funded by the National Geographic Society, focused on an area around the upper Tapajos River, one of the central Amazon’s major tributaries. The research was enabled by a development that poses a threat to the ecosystem as a whole: the rapid clear-cutting of the Amazon forests for agriculture, mostly cattle ranching. The researchers followed up on the observations by visiting the sites in person, mapping and cataloging artifacts like fragments of ceramics. Future studies may use satellite-based laser imagery to peer under the remaining forest canopy, he said. “Probably, there are going to be a lot more sites under the forest,” he said. The team estimated the population of the sites they found at about 21,000 people. Based on those estimates and a calculation of the number of similar sites that might exist, the population of the southern Amazon rim might have ranged between 500,000 and 1 million in the years 1000 to 1500. As with other populations in the Amazon, it’s likely most of that population would have been wiped out after Brazil’s Portuguese colonists brought diseases against which the indigenous population had no natural immunity. “Even before the Europeans set foot in the area, it’s probable that disease spread very quickly, and the population started to suffer heavy losses,” de Souza said. For years, scientists believed most pre-Columbian inhabitants lived near the riverbanks. But similar settlements have been found in the forests of the southwestern Amazon, de Souza said. So the researchers suspected they would find more in the central part of the southern Amazon rim, much of which remains unexplored. While it may be a stretch to say the entire region was densely populated, “We can say that at least in this area and the surrounding regions of southern Amazonia, the populations were much larger than previously thought,” de Souza said.